Is that a Cthulhu kid's shirt? Awesome! Man, that is one stunning fleece you have there. I have a total envy. I cannot BELIEVE we didn't have the guts to walk up to Alden Amos. I am kicking myself for that and for not bringing my Big Book. Maybe next year, right? We go to Rising Meadow Farm's sheep shearing in Liberty, NC and they have a master shearer come. He does it with hand shears. Takes about 45 minutes per sheep and he works bent over for 2 days straight! 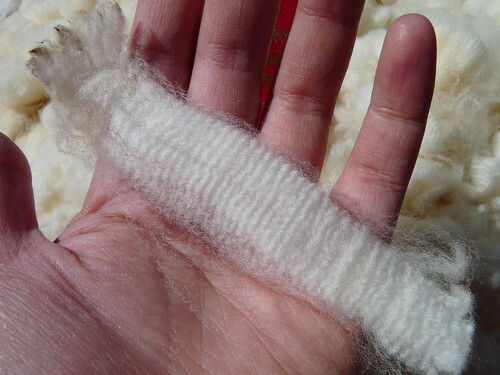 I'm not sure why they do it this way...if it allows for a better quality fleece for handspinners or some other reason. But it's great fun to watch! Thanks for sharing all the judging notes! I love learning new stuff. 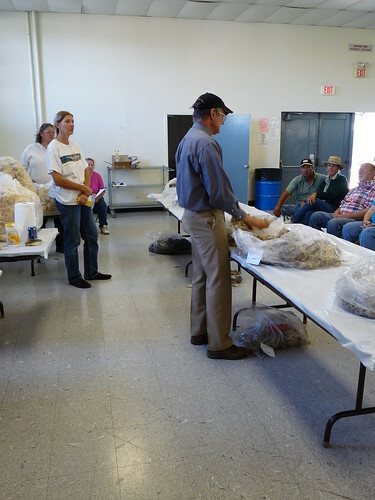 Thanks for the great tips on selecting a fleece. 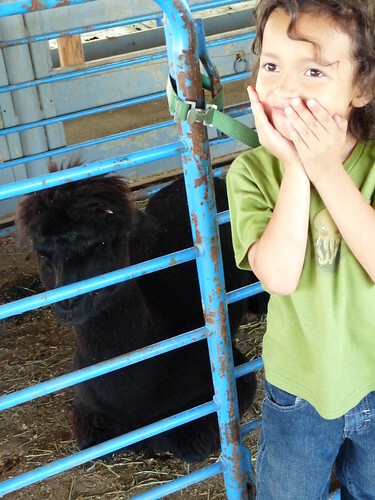 I luv getting to share in your fibre experiences! 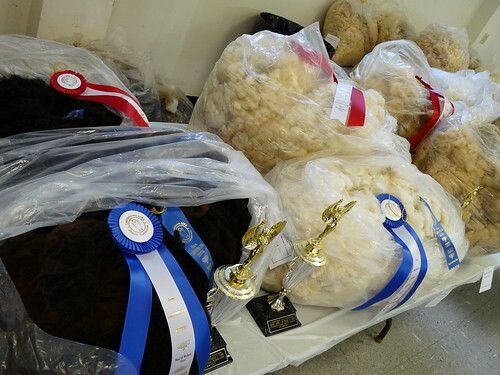 The shearing competition at our State Fair docks points for each nick and evidence of second cuts on a sheep. They even circle it in farmer's crayon so it can be counted later if there is an argument. 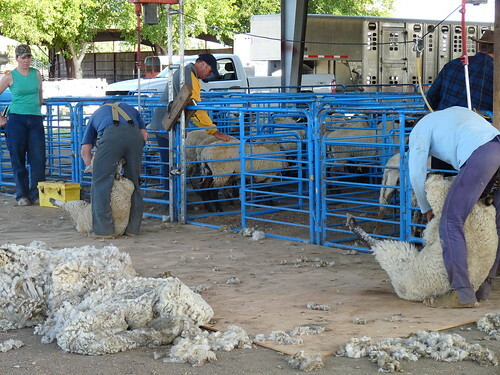 A shearing competition should be about speed, efficiency, AND safety. 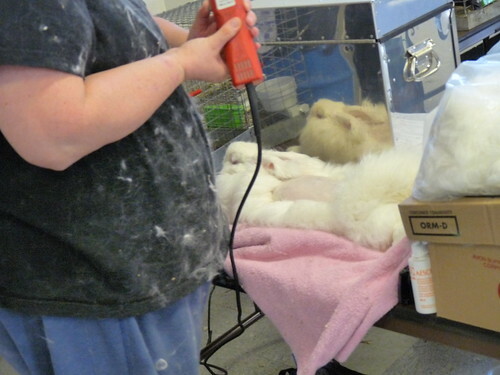 Each nick is a potential infection site which can reduce the animal's production in coming years. You always provide such helpful info. Thank you! Very interesting and informative! What exactly is "pinging" anyway? Is the ping test just basically eyeballing and handling the locks or do they use a special tool to "ping"? So many new questions! Thank you for sharing your notes. I really learned a lot from this year's judging. That sounds like it was a really great day! Thanks for posting your notes. I found them very interesting. 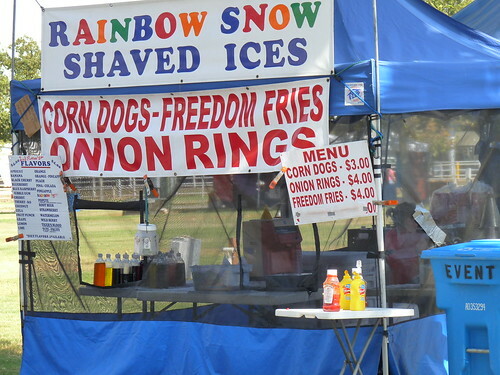 I would have liked to go to Lambtown this year, but something came up. Glad you went and had a good time. Beautiful fleece you have! Thanks for sharing your notes. 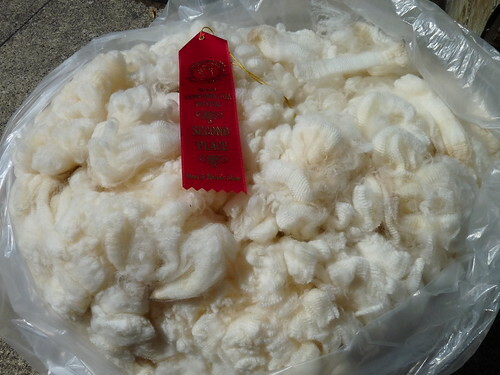 I was listening to wool judging at Black Sheep this year and the judge was picking on a Shetland fleece because the color changed abruptly in mid-staple. He was speculating that it was the result of a nutritional problem- but a number of shetland folks where there who graciously explained that it is fairly common for shetland lambs to sometimes change colors (usually gray, or fade-out)that suddenly. Was really interesting. So jealous of the lovely fleeces you are picking up. I missed Lambtown this year cos I was almost on a plane to Australia. I have been missing your blog :-( I hope that everything is alright, and that you will one day find the time to keep teaching us all of the cool stuff that you have been learning!